The history of the ICS began with the creation of the Social Science Research Group (GIS), in 1962. Founded in 1962 by Adérito Sedas Nunes, a charismatic figure of Portuguese sociology, and integrating a small number of bright researchers in Social Sciences, whose work combined freedom and innovation in research with a genuine interest in the constraints of Portuguese society, the GIS made a considerable impact in a society where social sciences were regarded with suspicion. A series of Gulbenkian and Government Fellowships, during the late 60's and early 70's, allowed GIS to expand and to incorporate new researchers. Since the very first moment, GIS started a Library that became the most important research library in Social Sciences in Portugal. One year later, GIS initiated the publication of Análise Social the first scientific journal to host social science research on Portuguese issues, namely social modernization, critical dimensions of life-courses, educational and economic development processes, as well as the historical dynamics related with them. The political changes of 1974 had a decisive impact in social sciences. Benefiting from the return of a number of former exiles, the GIS expanded its staff and diversified its research. Contributions on epistemological and methodological issues, as well as a systematic inquiry into the making of the social and political identity of contemporary Portugal, are highlights of this period. In 1979, the AHS-Arquivo de História Social (at that time called Archive of Working Class History) was established. The Archive hosts donated collections of documents by researchers and other social and political actors and constitute a valuable resource for research on issues related to the social history of the contemporary world. The year of 1982 was an important turning point, since GIS became an "organic unit" of the University of Lisbon, changing its name to ICS (Institute of Social Sciences). 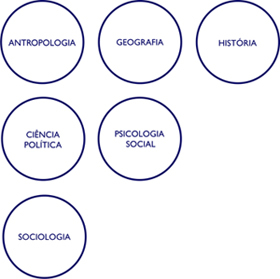 Sociology, History, Anthropology, Demography, Economics and Social Psychology were the main disciplinary areas of research, combined with a permanent focus on interdisciplinarity, one of the main features of its research tradition. The impact of the scientific production of ICS contributed, in different aspects, to the renewal of some of these disciplines. Between 1990 and 1991, Maria Filomena Mónica became the Chairman of the Government Board of ICS. With a PhD in Sociology from Oxford University, she authored several sociological and historical books. During that period, Manuel Villaverde Cabral was the Chairman of the Scientific Council. With a PhD in History from the École des Hautes Études en Sciences Sociales de Paris, Villaverde Cabral is also an author of important sociological and historical works on contemporary Portugal, former Director of the National Library, professor in several universities, national and international, and Vice-Dean of the University of Lisbon. From 1992 until 2007, the Chairman of the Government Board was Eduarda Cruzeiro. An important Portuguese sociologist, with a PhD from the École des Hautes Études en Sciences Sociales (Paris), Eduarda Cruzeiro integrated ICS from its very beginnings, while teaching, at the same time, at ISCTE-IUL. During her years as Chairman of the Government Board, Manuel Villaverde Cabral was the Chairman of the Scientific Council between 1991 and 1997, and João da Pina Cabral occupied that position from 2004 up to 2007. Pina Cabral is an internationally respected social scientist who has published widely in the area of social anthropology and is presently Head of School of Anthropology and Conservation at the University of Kent, UK. This was a period in which ICS changed, in many different ways, its institutional profile. ICS launches its first post-graduate course - a Master in Social Sciences - with two main lines of research: Culture and Social Change, and History and Sociology of Power Relations. From this moment onwards, ICS became an I&D Research Unit, financed by Fundação para a Ciência e a Tecnologia. This funding allowed the expansion of ICS and its institutional consolidation. Since then, new research projects, the extension of Post-Graduate programmes, as well as investment in the expansion of the Library of ICS infrastructure, and of editorial projects have been launched. This was a period of increased internationalization, also in the widening of themes of research, which included ever more transnational issues. Imprensa de Ciências Sociais, which became the most important Portuguese university press dedicated to the research in Social Sciences is launched. The establishment of Bolsa Afro-Brasileira de Ciências Sociais (Social Sciences African-Brazilian Fellowship in Social Sciences) promoted annual visits and the stay of several scholars from these regions at ICS. While Manuel Villaverde Cabral became Vice-Dean of the University of Lisbon, Doctoral Programmes in Social Sciences were launched. ICS was recognised by the Portuguese Ministry of Science as an Associated Laboratory. This allowed the integration of new researchers, the broadening of its research teams, new post-graduate programmes, as well as the strengthening of internationalization. This recognition was associated with the classification of ICS as Excellent by the research assessment developed by international panels in the years of 1996 and 1999. Five research lines organized the individual research developed at ICS: The making of contemporary world, Citizenship & Democratic Institutions, Sustainability: Environment, Risk & Space, Families, Lifestyles & Education, and Identity, Migrations and Religion. ICS moved to a brand new building, expressly built to support its research needs, thus making it possible to develop the broad range of activities that currently characterise the Institute. Between 2007 until 2009 (when he left as Vice-Dean of the University of Lisbon), Manuel Villaverde Cabral became the new Chairman of the Government Board. In 2007, and together with Jorge Vala, Chairman of the Scientific Council, Villaverde Cabral commemorated the 25th anniversary of ICS as a research institution of the University of Lisbon, broadening its institutional goals, and focusing on carrying out excellent, internationally recognised research. Due to Manuel Villaverde Cabral retirement, José Manuel Rolo, Senior Fellow of ICS and a Portuguese economist with an important track record in government consultancy, occupied the position of Chairman of the Government Board between June and October of 2009. Jorge Vala was elected Director of ICS, for the period between 2009 and 2014, holding simultaneously the office of Chairman of the Scientific Council. A Social Psychologist, specializing in Racism issues, Jorge Vala has a PhD from Louvain University, and has taught in several national and international universities. In 2010 Jorge Vala received the Codol Prize of the European Association of Social Psychology, as well as a Career Prize form the Portuguese Association of Psychology. During this period, ICS expanded its Doctoral Programmes and started the project of a Doctoral School in Social Sciences. ICS offered several courses in the areas of Anthropology, Geography, History, Political Science, Social Psychology and Sociology. Inter-university PhD programmes (such as PIUDHist - and Climate Change and Sustainable Development) were established. Additionally, several Summer Schools were launched. ICS becomes involved in a new process of scientific evaluation and funding, concerning the period of 2015-2020. ICS community was deeply engaged in this process, which increased its reflexivity and internal cohesion. Under the title of Changing Societies: Legacies and Challenges, analysed through the lenses of Inclusion, Citizenship and Sustainability, this programme proposes a research agenda that builds on the Institute's fifty years of excellence and paves the way for a new era as a research unit within the newly-merged University of Lisbon (ULisbon). Inheriting the patrimony of the previous Research Lines, research at ICS is from now onwards reorganized into seven Research Groups: Power, Society & Globalization; Empires, Colonialism & Post-Colonial Societies; Regimes & Political Institutions; Socio-Political Attitudes & Behaviors; Identities, Cultures, Vulnerabilities; Life course, Inequality & Solidarity: Practices and Policies; and Environment, Territory and Society. ICS intends to consolidate its position as Center of Advanced Studies and has already been recognised as a School of the University of Lisbon. In 2014, José Luís Cardoso was elected Director of ICS. A former Professor of ISEG, with a PhD in Economics, José Luís Cardoso joined ICS in 2006. An internationally known specialist in the History of Economic Thought, Cardoso collaborates with several national and international universities. Co-editor of the journals The European Journal of the History of Economic Thought and the e-journal of Portuguese History, he is also the coordinator of the Intra-university PhD in History, PIUDHist, as well as President of the European Society for the History of Economic Thought (2014-2016). Previously a Deputy Director of ICS, José Luís Cardoso coordinated the task force that put forward ICS research programme until 2020. At the same time, Ana Nunes de Almeida was elected Chairman of the Scientific Council. Also the coordinator of the Intra-university PhD in Sociology, OpenSoc, former Pro-Dean of the University of Lisbon, Ana Nunes de Almeida is an important Portuguese sociologist, who has published intensively in the areas of family childhood and education. She launched the Observatory on Education (at ICS) and the Observatory of Students' Trajectories (at the University of Lisbon).